The US government is up with a new security measure banning electronic devices excluding smartphones in the aircraft cabin for US-bound flights from and through the Middle East. The same measure has been adopted by the United Kingdom too. Brought into effect on March 21, 2017, the ban on electronic devices other than smartphones in cabin bags is strictly applicable to Emirates Airlines, Qatar Airways, Etihad Airways, Turkish Airlines, Kuwait Airways, Saudi Arabian Airlines, EgyptAir, Royal Air Maroc, and Royal Jordanian operating flights to USA from and via Dubai, Doha, Abu Dhabi, Istanbul, Amman, Kuwait City, Casablanca, Cairo, Jeddah and Riyadh. However, U.S. airlines are exempted from the restriction since they don’t operate flights to USA from these cities. The UK government debars British Airways, Thomas Cook Airlines, Thomson Airways, EasyJet, Atlas-Global Airlines, Pegasus Airways, Turkish Airlines, Jet2.com, Monarch, Tunis Air, EgyptAir, Saudi Arabian Airlines, Royal Jordanian, and the Middle East airlines from carrying electronic devices except smartphones in the cabin on inbound flights from and via Turkey, Egypt, Jordan, Lebanon, Saudi Arabia and Tunisia. Unlike the United States, the UK has kept flights from Dubai, Doha and Abu Dhabi out of the ban on electronic devices as carry-on items. The cabin crew of the airlines in question, including inflight attendants, is not within the purview of the ban by the US and the UK. 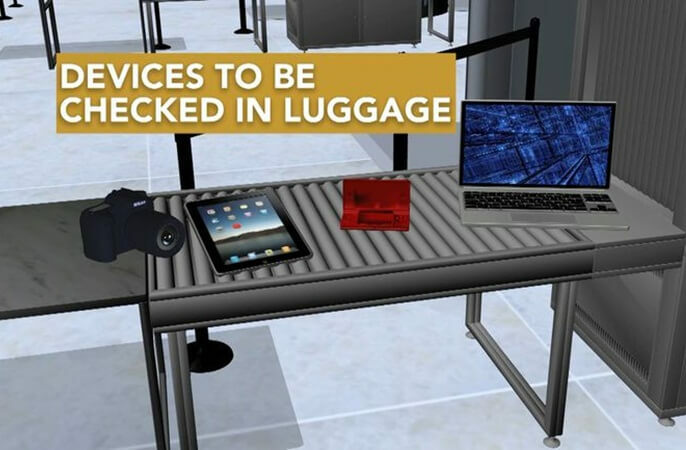 You can no longer carry electronic gadgets including laptops, tablets, cameras, gaming devices and likes as part of free cabin baggage while flying to USA and the UK from or via the above-mentioned airports. However, the ban on electronic devices in the aircraft cabin does not apply to outbound flights from the US. You can carry medical devices in the cabin only after fool-proof screening at security checkpoints of airport terminals. Alongside the security measure implemented by the US and the UK, some questions and doubts have arisen. If valuable electronic gadgets are safe in checked bags, is a question now. Many travelers are apprehensive about possible loss of or damage to their electronic devices in check-in bags. Whether the airlines flying from and via the Middle East will accommodate electronic devices within the existing weight limit of free check-in baggage or revise their free check-in baggage policy to increase the permissible weight limit, is a question too. Emirates and Turkish Airlines have already mandated it for passengers to check in electronic devices excluding smartphones from March 25. Qatar Airways and EgyptAir will be complying with the restriction from March 24. The other airlines in question will soon follow the directive issued by the US and the UK government. Note: Emirates Airlines announced to provide the passengers of US-and-UK-bound flights with a free packing-and-handling service at the airports which are within the purview of the ban on large electronic devices as carry-on items. The passengers of Emirates flights to USA and the UK from those airports will be able to carry their laptops and tablets to the boarding area. They can use the devices until boarding time even after checking in. The security staff deployed at boarding gates will collect the devices at the time of boarding and pack them into safe boxes for loading onto planes. The passengers will be handed over their devices upon arrival at destination airports in the US and the UK. This complimentary service is also available for the passengers of US-and-UK-bound Emirates flights transiting through those airports including Dubai International Airport. Travel Beats is a leading community portal by Indian Eagle, a trusted travel partner of Indians in USA. Travel Beats publishes the latest air travel, visa, immigration and Indian community news. Subscribe to our free newsletter for the latest updates.